講演者：Prof. Giuseppe Scellato, Politecnico di Torino. 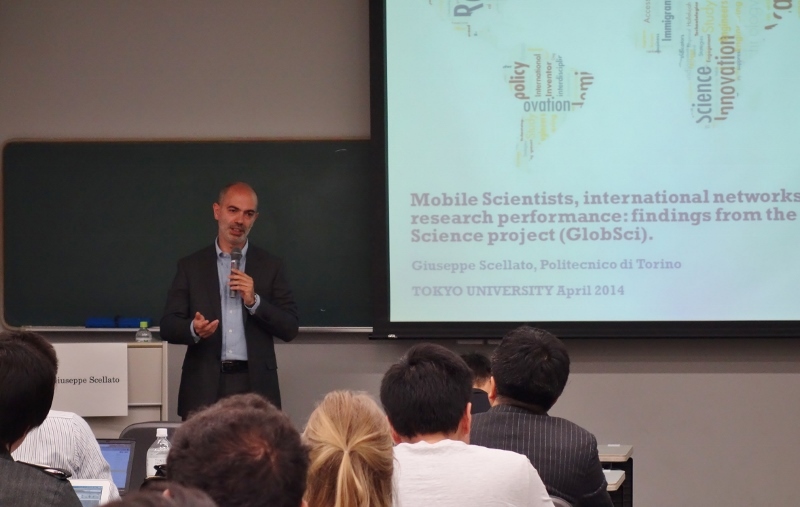 Scientists international mobility:impact on performance and networks. The research group of Prof. Scellato has conducted Global Science Project (funded by the US National Bureau of Economic Research and the Italian Government) since 2011, which aims at improving our understanding on the international mobility of scientists, their networking and team composition. The project involved a large survey that produced over 19 thousand responses from scientists in 16 countries (Japan, US, etc.). At the present time it represents the most comprehensive survey of international mobility. Based on extensive analyses from the rich data, Prof. Scellato reports some key findings, including the variation in the immigration and emigration patterns across 16 countries, determinants of international mobility, impact on scientific performance, and collaboration patterns of mobile and immobile scientists, and discusses policy implications. Foreign-born scientists: mobility patterns for 16 countries. Nature Biotech, 30: 1250-3, 2012. Choice of Country by the Foreign Born for PhD and Postdoctoral Study: A Sixteen-Country Perspective. NBER Working paper, 2013. Migrant Scientists and International Networks. Research Policy (forthcoming). The mover’s advantage: The superior performance of migrant scientists. Economic Letters, 122: 89-93, 2014.